IUD-SCM clash on the cards? At the same time changes in the top management of several state coalmining establishments in the area [who are close to IUD] has taken place. PM Yanukovych's new administration has replaced managers with others that have links with Akhmetov's enterprises. A political scientist, Vladimir Polokhalo considers that in the Ukraine a process of redistributing of property and spheres of influence is taking place, and this process has a regional component. An example is the division of Luganshchina between "Orange Donetskye" (IUD) and "bluey-whites" (Akhmetov, SystemCapitalManagement). "Today the ground is crumbling under the feet of those regional structures which are oriented toward Yushchenko. This is manifested in the budgetary policy, where there is discrimination displayed against some and privileges offered to others - this is becoming a basic feature of today's economy of the Ukraine, " considers Polokhalo. He notes that either a pact of armistice may be drawn up between IUD and SCM, or some kind of war is probable. "Today a representative of IUD [Aleksandr Chaliy, a Vice President of that company] has been appointed to the Secretariat of the President on Bankova Street and this attests to the fact that the equilibrium in the distribution of the market for eastern region will be disrupted, " he added. Aleksandr Chaliy is also a former Deputy Foreign Minister. Arseniy Yatsenyuk, until recently the Ministers of Economics has also joined and bolstered the Pres's administration. The prime minister of the Ukraine Viktor Yanukovich sustained an injury to the frontal part of the head. When participating in the traditional kissing of a icon in the Svyato-Uspensky Cathedral, Donetsk, he struck his forehead firmly against the protective glass. As a result of this there appeared a reddening from the impact on the right side of the forehead of the leader of government. Yanukovich was visiting the Cathedral to take part in the orthodox liturgy, where he was greeted at the gates by the Donetsk and Mariupol Metropolitan Illarion. Yanukovich brought with him a 1.5m square icon as a gift. When asked by journalists, what was depicted on the icon, neither members of the press- service of the Donetsk Oblast administration, nor the PM's press- secretary Denis Ivanesku, could give an answer. Today President Yushchenko was supposed to attend a widened meeting of the Cabinet of Ministers, but in the event he decided not to go. Newly appointed deputy head of the Pres. Adminstration, Arseniy Yatsenyuk, said that there was no point the Pres. attending as the work of the government could only be assessed after 9 months or a year. Some oblast governors, who were supposed to attend too, said that one of the items on the agenda was to be the sacking of 5 of their number. Dismissing governors has always been the prerogative of the President, so not for the first time, Yanuk may well be exceeding his powers and treading on Yush's toes. Yush is to meet his oblast governors and city mayors tomorrow. "It is possible that V.Yushchenko may be trying to secure the support of "heavy" Russian capital as a counterweight to the Victor Yanukovich-Rinat Akhmetov tandem. The fact that information about the President's meeting with Fridman appeared on the Head of The State's website exactly at the time the President was to be present at the session Of KabMin, perhaps supports this." Will all these 'digs' in the Pres's ribs reduce the possibility of NSNU soon joining the anti-crisis coalition? The text of their coalition agreement is '95% ready'. The position of the chairs in the KabMin may have cost the anti-crisis coalition a few NSNU deputies' VR votes. "The American oil companies Chevron and ConocoPhillips could be shut out of a massive Arctic gas project in a sharp chilling of trade relations between Moscow and Washington. Substantial volumes of liquefied gas from Shtokmanovskoye in the Barents Sea, originally earmarked for export to the United States, could be redirected to Europe, President Putin said. The shift in policy, revealed by Mr Putin after talks with the French President and the German Chancellor at the weekend, will be a blow to efforts by American energy companies to secure access to one of the world’s largest gasfields. Anger is mounting over continuing American resistance to Russia’s accession to the World Trade Organisation and a decision by the US State Department in August to impose sanctions on two Russian arms companies, Rosoboronexport and Sukhoi, for their alleged supply of arms to Iran." More on the sanctions against the two arms companies here. Now the latest 'Jane's Defence Weekly' claims Ukraine is selling the passive aerial target detection and identification system to Iran. The story is not substantiated, and may or may not be true. I have seen no response until now from Ukrainian authorities. The Kolchuga system is totally passive - on its own is incapable of swatting a single mosquito, but is effective in detecting 'stealth'-type weaponry. The arms industry is an important earner of foreign currency for Ukraine. One of the reasons many Ukrainians are not keen on joining NATO is they [probably correctly] consider it would have a negative impact on its high-tech armaments industry, predominantly located in the eastern regions of the country. It will be interesting to see if the US State Department pursue this further. Last Wednesday, a VR commission investigating accusations by BYuT deputy Oleh Lyashko, that Oleksandr Moroz had been bribed by PoR with $300 million to 'switch horses' and bring down the 'Orange coalition, concluded that there was no evidence to support this and that the accusations were groundless. Lyashko presented the commission hearing with an audio cassette recording of what he claimed was a conversation between leading PoR man Klyuyev, and a Moscow businessman called 'Ruben', in which alleged bribes paid to the Socialists were apparently discussed. Lyaskho was asked to play the tape in a dictaphone machine, but claimed that he was unfamiliar with the piece of equipment and didn't know how it worked. When members of the commission tried to play the cassette, they noticed that the tape was torn and unplayable - Lyashko's hearing submission turned into a farce. Some members of the commission accused Lyashko of trying to 'set them up' using a cheap stunt, making it look as if it was they who purposely damaged the tape. The normally pro-BYuT 'Oglyadach' has an interesting postscript to this story. Several years ago in the days of Kuchma, once, when the then-Prosecutor-General Svyatoslav Piskun was addressing the VR, Yuliya Tymoshenko [no friend of Piskun] suddenly grabbed his arm, checked out his watch, and triumphantly declared through a microphone that the P-G, a mere humble civil servant, has a $10,000 watch on his wrist - a solid gold 'Vacheron Constantine'. 'Oglyadach' noticed that after the fiasco at the commission hearing, when Oleh Lyasko, supposedly a man of principle, was dragged in front of the press, he too was wearing a similar 'Vacheron Constantine' watch. 'Oglyadach' suggests that Lyashko may have been paid off to 'trash' the tape, and that his behaviour has now lessened the chances of any future allegations being treated seriously. Oh how Ukrainian deputies love to wear show off swanky gold wrist watches..
Today minister of the Interior Yuriy Lutsenko stated that Russian authorities have no intention of detaining two Ukrainian senior politicians who are suspected of committing serious crimes, and who are now residing in Russia. Ukrainian authorities would like to commence extradition proceedings against former Odessa mayor Ruslan Bodelan, and Former Kyiv regional administration head Anatoliy Zasukha, but it seems this cannot happen until they are detained. Zasukha's wife is a PoR VR deputy [#117 on the list], as is Scherban's son, Artem. Watch Yanukovych's interview on 'EuroNews' in English and in Russian. EuroNews: Has the direction of Ukrainian foreign and domestic policy changed because the government has fewer "orange" members and more from your "white-blue" party? What should Europe expect from these changes? Yesterday it was revealed that the U.S. Department of Justice has directed a number of queries to Ukrainian authorities about the origin of a $2 million bail, paid to release the former governor of Sumy region Vladimir Shcherban [see photo] from custody. According to an article in 'Kommersant-Ukraina' the money was from an account linked to Akhmetov's System Capital Management. Unsurprisingly, SCM deny any involvement. 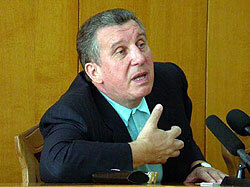 On 25 April 2005 a criminal case against Shcherban was opened after he was suspected of the crimes of extortion, exceeding his official authority, and other crimes. An international search warrant was issued in the following month by the Ministry of Internal Affairs, and in October 2005 Shcherban was detained in Miami, Florida and held in custody for violation of immigration legislation. According to the information from Interpol, Ukraine requested his extradition, and the U.S. Government began deportation proceedings. The former governor of Sumy region then turned to a local law court requesting political refugee status. At one of the judicial sessions last January Vladimir Shcherban was freed from custody after $2 million bail was paid by his attorney, Mr. George Balan. The Department Immigration and Customs of theUS Department of Justice has conducted its own investigation into the financial activities of Shcherban. In the course of these the American department obtained bank documents which suggest that directly before the release of Mr. Shcherban, the Balan Company International may have received $2 million from System Capital Management, via the Cyprus Popular Bank Ltd. According to a source, after obtaining this information, the Department of Immigration and Customs Service requested that Ukrainian law enforcement agencies establish that the sum was legally transferred. From July of this year several such requests have been made, but so far - no reply. Although SCM spokesmen have denied putting up Shcherban's bail, the attorney of Donetsk region head Boris Kolesnikov, Anatoliy Korzheva, has confirmed that SCM were ready to put up this sum (10 million hryven) to release Scherban from custody. Why should Ukraine's biggest industrial and business corporation, which is closely linked via its owner to the ruling party, be putting up bail in another country for someone who, while in public office, may have committed serious crimes? p.s. 32 year old Artem Vladimirovych Scherban, a newly elected PoR parliamentary deputy, is #140 on his party's list. There are dozens of PoR parliamentary deputies associated with SCM and its subsidiaries. A few days ago President Yushchenko appointed a new head for his Presidential Secretariat - 43 year old Viktor Baloha from the Zakarpattya region, who in recent years had been mayor of Mukachevo, chair of the Zakarpattya oblast administration, and latterly, Cabinet Minster for Emergency Situations. He has been brought in to shore up and better protect the President's office against attacks from Yanukovych and PoR, possibly in the same manner that Viktor Medvechuk [a former SPDU(o) associate of Baloha's] fulfilled this role for former President Kuchma. As with Medvedchuk, Baloha also has a decidedly 'mixed' background. Both of them came to prominence in the '90's in the independently-minded westernmost Zakarpattya oblast which is geographically separated from the the rest of the country by the Carpathian mountains. Both were associated with shady business/political clans which burgeoned during this period. The oblast's proximity to western neigbours Romania, Hungary, Slovak Republic, and Poland inevitably makes 'import and export' an important part of the local real and shadow economies. In the mid '90's a local 'strongman' [Hesha] began legalizing his large financial assets, and formed the largest commercial structure in the region - 'Barva', which dominated the wholesaling, distribution and retailing of products such as cigarettes, alcoholic drinks, medicines, construction materials, etc. in this part of Ukraine. One of its founders was Baloha. Mukachevo is still regarded as a 'one company town' - the company being 'Barva'. The current mayor of Mukachevo is Vasyl Petyovka - Baloha's cousin, and the largest local TV station 'M-studio' is owned by Baloha. As governor of Zakarpattya, he oversaw and allegedly participated, via 'Barva's sister companies, in reckless de-forestation of Carpathian forests. Baloha is associated through his wife, with well over a dozen large enterprises in this region. Although not is the same league as the oligarchs of the industrialized Eastern and Central Ukrainian oblasts, it could be said that his rise to power followed a similar path to theirs, evolving from 'wild' capitalism tainted with criminality, followed by entry into shady local politics, and finally maturing in a relatively stable position of power. By appointing Baloha to head his Secretariat, President Yushchenko risks tarnishing even further his image as a 'goody-two-shoes'. Yushchenko has today also recruited two former ministers to the Presidential Secretariat. They are Arseniy Yatseniuk, ex-economics minister, and Viktor Bondar, ex-transport minister. The President of Ukraine has announced that he has commissioned the general Office of Public Prosecutor to investigate allegedly illegal discriminatory V.A.T. reimbursements made in August to large enterprises, a matter about which I blogged a couple of weeks ago. What did the President expect with Mykola Azarov as Minister of Finances? The Illich M.M.Plant, is owned by one of Ukraine's top Socialists and richest men - Vladimir Boyko, and is a commercial rival of the Akhmetov-owned Azovstal, which is also located in Mariupol. The other two enterprises mentioned that have received VAT refunds are [surprise, surprise] also part of Akhmetov's S.C.M. group. The Socialists are supposed to be partners in the new ruling parliamentary coalition - Boyko will not be a 'happy bunny'. Prosecutor-General Medvedko will no doubt file the President's request in his ever-growing 'things-not-to-do' box. An English translation of an original Russian language article on the 'Ostrov' website - 'Did politics kill Yerokhin?' gives a possible explanation why Roman Yerokhin, a Ministry of the Interior senior organized crime investigator was murdered, and why this crime may never be solved. What a tangled story it is.. [the original Russian piece is just as bad]. Yerokhin was considered to be a 'Vladimir Malyshev man'. Malyshev is now a PoR deputy and security director of Akmetov's huge S.C.M., but was at one time head of the Donetsk oblast militia. Yerokhin, before he was murdered, was trying to 'shake down' Sh., a BYuT VR deputy and the main suspect in this crime, while at the same time working for Minister of the Interior Yuriy Lutsenko. "Then Sh. makes the decision to ‘sort out' the militiaman [Yerokhin]. Additional arguments [that help Sh, to make the decision were] the discredited Yuri Lutsenko wouldn’t be long in his chair, and the Prosecutor-General [could be relied on] to close the case. We see, in order for the [Donetsk] authorities to provide cover, or maybe because he had no organizational experience [in such matters], Sh. turned to an old acquaintance - a PoR deputy; and he helps to organize the 'business'. It's hardly likely that the latter acted without approval [from above] - in some groups in the Regional's fraction there is rigid discipline, and any such serious questions are referred to the leaders of the groups. So, one can only a guess that the militiaman's execution was authorized [in order for it to be used] for political purposes...The Yerokin case enables attacks to be launched against both Tymoshenko and Lutsenko..."
Several days ago, PoR deputy Eduard Prutnik was elected head of of the State Committee on TV and Radio Broadcasting in a vote in the VR. Prutnik is a 34 year old high-flier. He has served as the deputy head of the Donetsk oblast council, was an adviser to Yanukovych during his first spell as PM, and has served on the supervisory council of the State Savings Bank of Ukraine. Yanukovych 'regards him almost as a son.' He is linked in various capacities to well over a dozen large industrial, media, and financial enterprises. He was allegedly deeply involved in the 2004 Presidential election falsifications, together with Klyuyev, Levenets, Medvedchuk, Lyovochkin, and Kivalov. Such a overtly politically active person should not be in charge of the State Committee on TV and Radio Broadcasting - particularly after the crude manipulation of the media and 'shut out' of Presidential candidate Yushchenko during the last months of President Kuchma's administration, which many Ukrainians citizens found so sickening. Today BYuT parliamentary deputy Oleh Lyashko promised to reveal a transcript of telephone conversations which he claims prove that Oleksandr Moroz's 'Socialist Party of Ukraine' were bribed by PoR to ditch the Oranges, and join with them in a grand coalition. Lyashko informed reporters on July 24th that this material was in his possession, but since then - nothing. He also promised to hold a press conference this Saturday when the alleged incriminating recordings will be aired. Apparently deputy Prime Minister Andriy Klyuyev is heard in a conversation with someone in Moscow, discussing the receipt by the Socialists of $300m to wreck the Orange coalition. A parliamentary investigative committee are looking into the matter, and may invite Yuliya Tymoshenko to attend their next session on 20th September. Eduard Prutnik was yesterday confirmed head of the State Radio and Television Broadcasting Committee [Derzhkomtelradio]. Former VR speaker Volodymyr Lytvyn's 'Narodna Partiya Ukrainy' party [NPU] is going into opposition. During the March 2006 VR election 'Narodnyi Bloc Lytvyna', as it was then called, despite its leader's high profile, only obtained 2.44% of total votes cast, failing to reach the 3% threshold. Many had predicted 'Narodnyi Bloc Lytvyna' would comfortably clear this barrier. His party list included some pretty shady characters, including Ivan Fursin [Dmytro (the wallflower) Firtash's junior partner in dubious gas-trading middleman RosUkrEnergo], Serhyi Lyovochkin [involved in 2004 election frauds together with current PoR cabinet minister Andriy Kluyev, and others], and, head of Supreme court of Ukraine, (now-retired) Vasyl Malyarenko [a 'business partner' of deputy PM Mykola Azarov and discredited former Prosecutor-General and now PoR deputy Svyatoslav Piskun]. I have mentioned these guys before in previous blogs. "The President [Yushchenko] has made secret deals with PoR - they are absolutely identical!" declared one of NPU's leaders, Oleg Zarubinskiy. "We will analyze what the authorities are doing, we will expose its shady transactions, and anti-national actions," he added, [Oh yes? Pots often call kettles black in Ukrainian politics] giving an example: In August the enterprises of Donetsk region received disproportionately large VAT reinbursement from central government, while other regions received far less. Following defeat in the parliamentary selections, Volodymyr Lytvyn stated that he would be a candidate in the next Presidential elections. Lytvyn has proved to be a very shrewd operator over the years in Ukrainian politics. Despite being close to former President Kuchma, during the Orange revolution, when he was ostensibly a neutral Parliamentary speaker, he helped broker the re-run of the 2nd round presidential election in December 2004. Being in opposition is not really his style - maybe he knows something that others don't. Or maybe he is still ambitious and hungry for power, and there is nowhere else left for him to go. A story that has not received much attention concerns a report from Parliament Investigative Commission on Gas, chaired by the Socialist Andriy Derkach, "which discovered that government’s slackening control over state company 'Naftohaz Ukrayiny' and its affiliated companies has aggravated the situation in Ukraine’s gas market." The investigative commission received material from the Prosecutor-General's office that may indicate that Naftohaz's senior management violated the law, and that some of their actions may be interpreted as criminal. E.g. in 2006 the State Budget suffered big losses following the double payment for gas supplied by Petro Gaz FZA Company (United Arab Emirates). President Yushchenko's brother, now an NSNU deputy, has links with this highly suspicious company - something I have blogged about before. Derkach’s report states that Naftohaz has breached various custom procedures when performing exports-imports operations - "Naftohaz also has practically lost control over Ukraine’s gas and oil producing subsidiaries." Amazing..but not in Ukraine..
Yush poisoners to be named? An article in MIGnews today, quoting senior BYuT deputy Andriy Shkil, says that Yushchenko's alleged poisoners could be named in the next few days. Sensationally, Shkil declares that it will be one of the leaders of BYuT and, most likely, of Our Ukraine, who will be officially accused of the poisoning, but that these persons are "absolutely innocent." Shkil considers that the aim of this will be to discredit BYuT and OU with a huge scandal, and to simultaneously 'muddy the waters' even further . ps Tymoshenko has been complaining again that pressure is being applied to her boys in the VR, in particular onto former SBU chief Turchinov and Kozhemyakin, [who had carried out investigations into and possible corrupt links between Yushchenko's 'dear friends' and RosUkrEnergo] and that the businesses of businessmen in her bloc are being subjected to constant inspections. "Mr Putin referred to Ukraine saying that Russia had to consider the $5bn a year it has lost annually over 15 years in supplying cheap gas to Kiev. But – “Thank God” – there was finally an agreement earlier this year to raise prices. Mr Putin argued that Europe would suffer economically if its metal industries paid $250 per thousand cubic metres for gas while Ukrainian competitors paid $50. “It’s a political decision by our western European and American partners. It`s a mistake and a bad approach. No mention of Yanuk, who arranged the SCM-Gazprom deal with Putin a few days ago in Sochi, at all, but praise for Yush..Hmm. Some wild speculation: Perhaps Kremlin Inc. was somehow involved with the Yush poisoning, and maybe a skim-off from RosUkrEnergo 'divvied up' between Yush [and Putty] is some kind of compensation? Quite ridiculous to even think of this of course.. Accusations almost exactly a year ago by Oleksandr Zinchenko and people close to Yuliya Tymoshenko of corrupt schemes involving RosUkrEnergo-Yushchenko's close circle-'luybi druzhi' is what broke the back of the Orange Coalition. It is often assumed that PoR is a political monolyth, but as in any human enterprise or organization, there are differing priorities, conflicting ambitions, and varying aspirations amongst its members, which produce internal tensions. According to an article in 'Fraza', PoR can be divided into two groups or 'clans' - the 'old' and the 'young' Donetskiye. The former are lead by Yanuk and Azarov, the latter by Akhmetov and Kolesnikov. In simple terms, the former include those who for years worked in government administration, both at regional and national level. The latter are predominantly representatives of Donetsk business, who became rich in the years of "wild capitalism". The term 'young donetskiye' is appropriate - many are under 40 years of age. Rayisa Bogatyreva, one of PoR's leading VR deputies, and Tatiana Bakhteyeva (the personal doctor of Boris Kolesnikov, and a relative of rinat Akhmetov) are normally associated with the young Donetskiye. Unlike the oranges, PoR seldom 'wash their dirty laundry in public', but after a close associate of Yanuk, Anna German, publicly commented that Yanuk may be supporting Yush for President in 2009 it precipitated this curt riposte from Bogatyrova: "Such strategic decisions as the participation of political partyin presidential or parliamentary elections will be decided by the Party Congress. It is incorrect to discuss this now.."
A major reason for discontent amongst the young Donetskiye is the big governmental positions in Yanuk's cabinet have been given to old Donetskiye - kuchmistas who have been 'pulled out of their coffins'. The only exception is Vasyl Dzharty - a representative of the autonomous Makeyev clan. The situation in the PoR parliamentary fraction is not much better for the young Donetskiye either. Until Yanukovych was elected PM, the management of the fraction was dominated by the 'old boys'. Of 9 deputy leaders of fraction, the interests of Akhmetov/Kolesnikov were represented only by Bogatyreva and Kolesnikov. After the formation of the new KabMin, the young Donetskiye hoped to redress the balance. Despite Bogatyrova being selected as leader of the majority coalition [a sensible choice on account of her experience in the VR, both in good and bad times], the young Donetskiye did not get what they were hoping for. Yevhen Kushnaryov, someone from with few ties with either group, may have been an alternative choice for coalition leader, but was not favoured by either. The problem, which potentially could create the biggest waves in the party, is who will be their man in the presidential elections 2009. The old Donetskiye are interested in a long-term premiership for Yanukovych, approved and blessed by a neutered President Yushchenko, [hence German's comments]. The young Donetskiye have their own candidate for President - Rinat Leonidovich Akhmetov. Today Prosecutor-General Oleksandr Medvedko declared that there is no evidence to support allegations that one or more VR deputies were involved in the murder of senior UBOZ [Adminstration for combatting organized crime] money-laundering investigator Roman Yerokhin, adding that the information promulgated in the media in this matter, had been "greatly exaggerated". This statement flatly contradicts statements made over several weeks by Minister of the Interior Yuriy Lutsenko, who promptly responded at a press conference in Kyiv today. He warned that the investigation, which is now being undertaken by the P-G's office, is in danger of falling apart. "All these days, the prosecutor's office, having taken the case from us, [has merely] passed it on from the beginning from regional prosecutors to the city, then into the P-G's office, but has not undertaken any investigations." He said that the P-G's investigators have not even bothered to question the prime suspect - former policeman Vadym Klikovskyi, who is currently being held in custody. Instead it has been his own investigators who have been called in for questioning by the P-G's office. "I consider that all this indicates that there are endeavours to drag this case out, and possibly to conceal the truth.."
There is a war of compromat going on, and some of the mass media are attempting to turn this case against Lutsenko himself in order to push him off the political stage, even though he has doubts whether a PoR VR deputy is involved. Part of the PoR-sympathetic press is trying to discredit BYuT - with fingers being pointed at Oleksandr Shepelyev, a ByuT VR deputy. However internet sites 'close to BYuT' are hinting of a close business relationship between Yerokhin and Lutsenko, and possible corrupt schemes in the higher echelons of government. Yerokhin was found dead, killed by multiple gunshot wounds, on 20th August near Kyiv. Even if he was trying to 'shake down' powerful crooks for his own ends, he was a senior policeman who did not deserve this fate. His murder should be properly investigated, no matter where this could lead to. P-G Medvedko's statements strike me as having being made with indecent haste - and his recent declarations that the Yushchenko poisoning case is near to resolution, after 2 years, a diversion or smokescreen. P-G Medvedko and Min of Internal Affairs Lutsenko have also fallen out over the Vyacheslav Chornovil case. Lutsenk claimed recently that 'Rukh' leader Chornovil's death several years ago in a DTP [car crash] was murder, and not an accident. He also revealed traces of poison were found in the bodies of those who caused the accident. Medvenko, in a press conference today said, "I consider making such declarations at the moment impossible, as they discredit the sitation in this criminal case. They mislead the community." Another diversion? ps The latest edition of 'Dzerkalo Tyzhnya' carries a further article on this affair. It ponders whether such a deeply suspicious character as Yerokhin, about whom an official parliamentary referral had been made to the P-G late last year, should have been working for UBOZ at all. The 'DzT' piece asks even more questions about what clearly is a very murky business.. In the end, all secret agents become double agents.. In a brief interview yesterday, Yuliya T. again complained that some of her VR deputies are being offered bribes of $5-7 million to switch over and join the PoR-dominated anti-crisis coalition. She admits that some will defect, and claims that PoR's aim is to accumulate sufficient deputies to form a contitutional majority of 300. This would enable them to change the consitution and reduce the President's powers even further. The Ukrainian president in future would be selected by parliament alone, and be a 'figurehead' head of state only. PoR's top ideologue Yevhen Kushnaryov has declared that gaining such a majority is one of their chief aims right now, because it would enable them to change the fundamental laws of the country. PoR have high hopes of 'enticing' quite a few ByuTivtsi, particularly their businessmen into their ranks, offering them preferential business opportunites in the eastern part of the country. NSNU deputies could be holding out for inducements too while they 'wrestle with their consciences' even though eventually they can say they were merely following the President's wish when they join the grand coalition, a nice 'win-win' situation. First deputy Prime minister and Finance Minister Mykola Azarov has been looking after his pals again. 'Ukraina Moloda', quoting a document provided by the usual 'reliable source', claim that exporting manufacturers from Donetsk [and Lugansk] have received a far greater share of Value Added Tax reimbursements for the month of August, than similar exporting manufacturers from other regions of Ukraine. Three weeks ago MinFin decided to suspend VAT repayments entirely, but then Azarov corrected this decision, explaining that the gov't merely wanted to check the register of enterprises claiming VAT refunds, revealed that half of them were probably fictitious. He added that repayments would only be made to those enterprises that were 'worthy' of them. For August, instead of 313 million hryvens worth of refunds, [about $60m] Donetsk businesses received 696 million hryven; and of this sum, 153 million was paid out on the last banking day of the month. In contrast, other regions received far less than that to which they were entitled. E.g. Kyiv received only 60 million out of a planned 376 million. 'U.M' say this may indicate that the new gov. is not confident of finances in the months to come, and are making sure that their guys get their money back first, while there is still some money in the pot, before it's too late. When it comes to billionaires, Ukraine can proudly hold its head high amongst the countries of Central and Eastern Europe. The Polish 'Wprost' magazine has just published its annual list of the richest people in this part of Europe. Top of the christmas tree is Roman Abramovich with $19.5Bn - 47 other Russians appear there too. If I were a biddy biddy rich,Yidle-diddle-didle-didle man. "If it were suggested that Yushchenko and Tymoshenko were to take part in the next presidential elections, would Viktor Yanukovich support today's President?" She replied: "Yanukovich will support President Yushchenko in the next presidential elections, if their interrelations will develop in the manner they have started, if no close circle tries to 'privatize' the President [or] push him only towards one political group, towards one part of the population, then this tandem has a big future." She doesn't think Yanukovich himself will take part in the next Presidential elections, and considers that the President should be elected by the nation, and not by the VR. Will Yuschenko's health hold out though? pps Serhiy Lovochkin, one of former president Kuchma's closest advisers, has today been officially appointed Chief of the Prime Minister's Office, by the Cabinet of Ministers. He is getting back together in the corridors of power with one of his partners in the 2004 election fiddle, Sergiy Klyuyev .. [how nice for them] Yuk! Everything in the garden is rosy..
"After a year of significant change, Ukraine continues to be an attractive destination for foreign direct investment (FDI). The Orange revolution put the country in the international spotlight and has now carried a broad coalition into parliament. Despite upheaval, the country’s fundamental dynamics remain robust, as the country continues to advance from a low economic base. The improving business environment and the potential for World Trade Organisation (WTO) membership have further attracted attention from investors. ..despite the current political stalemate between the blue and orange parties, the medium-term political outlook for Ukraine looks relatively bright. With no more elections scheduled until the presidential election in 2009, Ukraine can enter a period of reforms and growth, apply for World Trade Organisation (WTO) membership and become more integrated in the global economy, leaving behind 15 years of underachievement"
ps the 'wilderness of mirrors' operation on the Yerokhin case has begun in the media. PM Yanukovych has been away on holiday so deputy PM Mykola Azarov has been running the shop, and has already made controversial statements about language issues, about clipping authority from the President, and and now has ruffled the president's feathers on budget issues. As minister in charge of finances he feels this is his department, and has publicly complained that the Presidential secretariat has made comments on budgetary policy. "I'm surprised at the tone of the declarations that the secretariat is preparing to study the budget, and that the President may not sign-off the law on the budget, if it does not suit the secretariat. There has been a whole series of incorrect expressions from which certain questions have sprung up, which I think, we will have to discuss with the President after he returns from holiday." He added though, that the KabMin wants constructive cooperation with the President. Azarov has maybe been acting 'above his station' while Yanuk has been away. During negotiations with NSNU after the March elections, when Yanuk went AWOL, Azarov declared that he was prepared to jettison Yanuk in order for PoR to join forces with NSNU in a coalition , so he is probably not Yanuk's favourite minister. He will need watching.. Some commentators now suggest that Yanukovych is now firmly entrenched as PM for the next few years. But there are many major problems for the gov to tackle in the months ahead, particularly a large budgetary deficit. PoR's oligarch supporters will claim their pay-offs. Some cut-backs in social programs have been mooted. Russia is going to play hardball over oil and gas. For Putin, supporting Yanukovych in the 2004 presidential elections was perhaps the biggest fiasco of his presidency, and the Russian media continue to blacken Ukraine and the Donetchany for their own purposes. Yanukovych's biggest asset is his genuine personal popularity in the east so he should keep Azarov and other cabinet members in their place to maintain his position for the duration. Many years ago a British PM, Harold Macmillan, was asked by a young journalist after a long dinner what can most easily steer a government off course, he answered "Events, dear boy. Events". Politics is unpredictable. Next Tuesday VR deputies return back from their holidays, and it's back to business again. The 81 newly-elected NSNU deputies have to decide where they are going to go - into opposition, or into the 'anti-crisis' or national unity coalition, [ACC] or whatever they are now calling it. One of the leaders of NSNU told 'Komersant-Ukraina' that President Yushchenko has given their bloc an instruction to enter the coalition and almost 70 may join up. Others, who oppose such moves claim no directives from the President have been given and that no more than 44 will agree to join the coalition. Some senior members of NSNU say that NSNU may not enter into a coalition with PoR at all, and that negotiations may drag on until the end of September, by which time NSNU will split. There is also some talk of a new party being formed around President Yushchenko, with former PM Yekhanurov and other NSNU deputies being involved, as well as minister of Internal Affairs Lutsenko. Other names linked to this project include Sergiy Tihipko and Vitaliy Klychko. A big stumbling block is the presence of the 21 Communists in the ACC. Deputy head of PoR's parliamentary fraction Evhen Kushnaryov says, "We also emphasize - we have a clear position: the coalition has already been created; we are ready to examine 'Nasha Ukraina's' conditions, but we will not examine any conditions concerning any party's exit on principle! Furthermore we understand that if the Communists leave, we lose political allies, and in exchange gain ideological rivals who have many queries on our program positions." Meanwhile, Tymoshenko has rode back into town after laying low for several weeks..How may disgruntled NSNU deputies will join BYuT, I wonder?